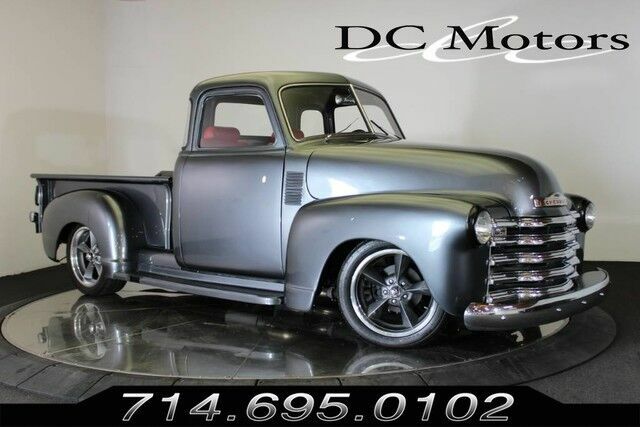 This Hot Rod Truck features a frame off restoration with 350 engine (completely rebuilt with 800 miles) and a 700R4 automatic overdrive transmission and rebuilt KBL transmission. No expense spared on this special rig. Here are some highlights from this custom build: serpentine pulley system side exhaust sculpted into the running boards shaved/suicide doors shaved hood custom paint job custom carpet, floor mats, door panels, seats and headliner by Bill Dunn in Mercedes red leather 4-11 gears posi rear end vintage air conditioning p ower steering, power seats, power windows high flow steel heads with stainless steel 1.94/1.60 intake and exhaust valves, hardened pushrod Scotts hot rods front end Front disc brakes EZ air ride system custom flow master exhaust And more! Call for complete list of additions and customizations. For more information about this vehicle and attractive financing options, please call our experienced sales team at 1-800-730-MOTOR. Stock # 5564CA, Automatic, 881 mi.